That we live in an age of grievance and victimhood is not news. But did these peoples -- these Mexican-Americans, these Native Americans, these African-Americans -- really lose more than they gained in their confrontation with the West? Were they robbed of nobility, and coarsened? Or did White subjugation force them to shed savagery and barbarousness, and bring them, however unwillingly, into civilized humanity? Today our children our being taught that the people who lived in the pre-Columbian Western Hemisphere were not "merciless Indian savages" (as Jefferson calls them in the Declaration of Independence), many of whom delighted in torture and cannibalism, but rather spiritually enlightened "native Americans" whose wise and peaceful nobility was rudely destroyed by invading European barbarians; that the Aztecs were not practitioners of human sacrifice and cannibalism on a scale so vast that the mind of the 20th-century American can hardly comprehend it, but rather defenders of an advanced civilization that was destroyed by brutal Spanish conquistadores; and that Africans were not uncultured slave traders and cannibals, but unappreciated builders of great empires. Every day they sacrificed before our eyes three, four, or five Indians, whose hearts were offered to those idols, and whose blood was plastered on the walls. The feet, arms, and legs of their victims were cut off and eaten, just as we eat beef from the butcher's in our country. I even believe that they sold it in the tianguez or markets. more than thirty dishes cooked in their native style ... I have heard that they used to cook him the flesh of young boys. But as he had such a variety of dishes, made of so many different ingredients, we could not tell whether a dish was of human flesh or anything else ... I know for certain, however, that after our Captain spoke against the sacrifice of human beings and the eating of their flesh, Montezuma ordered that it should no longer be served to him. In renouncing cannibalism, was Montezuma cooperating in the destruction of his Aztec "cultural roots," or was he aiding a victory of civilized custom over barbaric? Diaz also describes the great market of Tenochtitlan, and its "dealers in gold, silver, and precious stones, feather, cloaks, and embroidered goods, and male and female slaves who are also sold there. They bring as many slaves to be sold in that market as the Portuguese bring Negroes from Guinea. Some are brought there attached to long poles by means of collars round their necks to prevent them from escaping, but others are left loose." 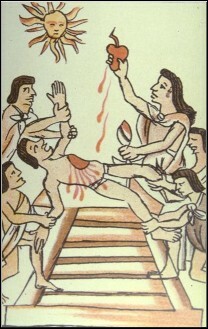 Following the ceremony in which humans are sacrificed to their gods, high-ranking Aztecs eat the flesh of the victims. (A contemporary Spanish illustration, from the Codex Magliabechiano.) A Spanish witness commented: "This figure demonstrates the abominable thing that the Indians did on the day they sacrificed to their idols. 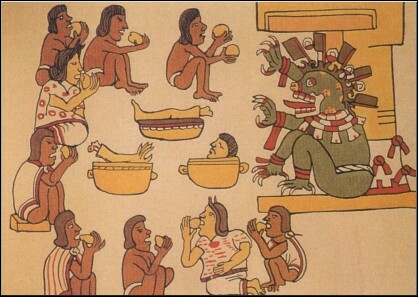 After [the sacrifice] they placed many large earthen cooking jars of that human meat in front of their idol they called Mictlantecutli, which means lord of the place of the dead, as it is mentioned in other parts [of this book]. And they gave and distributed it to the notables and overseers, and to those who served in the temple of the demon, whom they called tlamacazqui [priests]. And these [persons] distributed among their friends and families that [flesh] and these [persons] which they had given [to the god as a human victim]. They say it tasted like pork meat tastes now. And for this reason pork is very desirable among them." They bound the prisoners hand and foot, rekindled the fire, slung the kettles, cut the bodies of the slain to pieces, and boiled and devoured them before the eyes of the wretched survivors. "In a word," says the narrator [that is, the Algonquin woman who escaped to tell the tale], "they ate men with as much appetite and more pleasure than hunters eat a boar or a stag ..."
On the following morning, they were placed on a large scaffold, in sight of the whole population. It was a gala-day. Young and old were gathered from far and near. Some mounted the scaffold, and scorched them with torches and firebrands; while the children, standing beneath the bark platform, applied fire to the feet of the prisoners between the crevices ... The stoicism of one of the warriors enraged his captors beyond measure ... they fell upon him with redoubled fury, till their knives and firebrands left in him no semblance of humanity. He was defiant to the last, and when death came to his relief, they tore out his heart and devoured it; then hacked him in pieces, and made their feast of triumph on his mangled limbs. Of the above account, Parkman writes: "Revolting as it is, it is necessary to recount it. Suffice it to say, that it is sustained by the whole body of contemporary evidence in regard to the practices of the Iroquois and some of the neighboring tribes." The "large scaffold" on which the prisoners were placed, is elsewhere in his narrative referred to by Parkman as the Indians' "torture-scaffolds of bark," the Indian equivalent of the European theatrical stage, while the tortures performed by the Indians on their neighbors -- and on the odd missionary who happened to fall their way -- were the noble savages' equivalent of the European stage play. If the descendants of the New England tribes now devote their time to selling tax-free cigarettes, running roulette wheels or dealing out black jack hands, rather than to the capture, torture, and consumption of their neighboring tribesmen, should we not give thanks to those brave Jesuits who sacrificed all to redeem these "native Americans"? On invading the town, some of the warriors had found in the Chief's house several jars of rum, and now the bottle went round with astonishing rapidity. The ferocious and savage dance was then suggested. The war bells and horns had sounded the arrival of the female warriors, who on the storming of a town generally make their entry in time to participate in the division of the human flesh; and as the dead and wounded were ready for the knife, in they came like furies and in the obscene perfect state of nakedness, performed the victorious dance which for its cruelties and barbarities has no parallel. Some twenty-five in number made their appearance with their faces and naked bodies besmeared with chalk and red paint. Each one bore a trophy of their cannibal nature. The matron or leader ... bore an infant babe newly torn from its mother's womb and which she tossed high in the air, receiving it on the point of her knife. Other Medeas followed, all bearing some mutilated member of the human frame. The matron, commander of these anthrophagies, with her fifty years and corpulous body, led the cruelties on by her example. The unborn babe had been put aside for a bonne bouche, and now adorned with a string of men's genital parts, she was collecting into a gourd the brains of the decapitated bodies. While the disgusting operating went on, the men carved the solid flesh from the limbs of the dead, throwing the entrails aside. The barbecuing over, an anthrophagous repast took place, when the superabundant preserved flesh was packed up in plantain leaves to be sent into the Interior for the warriors' friends. I am silent on the further cruelties that were practiced this day on the unfortunate infirm and wounded that the different scouting parties brought in during the day, supposing the reader to be sick enough at heart at the above representation. This is the history that has been handed down to us by men who either were present when the recorded events took place -- that is, Diaz and Conneau -- or who had access to period documents -- that is, Parkman. But this factual history has suffered greatly at the hands of politically correct myth-mongers. The books themselves are disappearing from the shelves: Conneau's book has been out of print for nearly a generation; perhaps Diaz's and Parkman's will follow in the next 20 years. In its place, the most absurd historical fantasies are substituted. As the seemingly inexorable forces of political correctness grind on, we may be left with as much knowledge of our true history as Orwell's Winston Smith had of his. Foreign military conquest has not only enabled backward people to acquire the skills and the culture of the conquerors, but it has often administered a salutary shock to the lethargic mentality of the inhabitants, among whom the desire to rise to equality with the foreigners has roused a new spirit of energy ... Britain has permeated Asia and Africa with her ideas of government, of law and of ordered civilization. The men of races who less than a hundred years ago were naked are now lawyers, doctors and statesmen on the stage of the world. Journal of Historical Review 17, no. 3 (May-June 1998), 7-11.